2015 is the International Year of Soils, in recognition of the fundamental role our soils play in delivering ecosystem services that enable life on Earth. One of these critical ecosystem services is the provision of food: 95% of our food is estimated to be directly or indirectly produced on our soils. 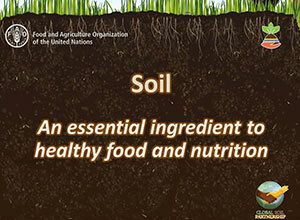 Soil health is key for nutrition, both as a key determinant of agricultural productivity and nutrient content of foods. But our soils are under threat. The October 2015 Ag2Nut call was held on this topic. Ronald Vargas and Lucrezia Caon from FAO’s Land and Water division described the various ways soils are fundamental for food and nutrition security, the current threats to soil health, and the strategies which can be promoted to prevent soil degradation and improve soil health. They also introduced the Global Soil Partnership and activities to promote sustainable soil management worldwide. They were joined by Ruth Charrondière, FAO food composition officer, and Charlotte Dufour, FAO Nutrition policy officer, for a facilitated discussion on how nutritionists and soil scientists can work together to promote soil health and human nutrition.